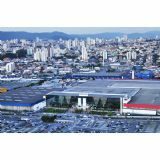 FEIMAFE is the main fair focused on Machine Tools and Quality Control in Latin America. The event brings together leading companies in the industry and provides a suitable environment for business relationship. More than 1,300 brands showcase their products and services ensuring the quality of the event by introducing trends and new technologies to market. The event generates great interaction among companies and professionals seeking to develop partnerships, learn about new products, technologies and knowledge update for direct application in their business. This allows visitors and exhibitors to expand their network of relationship and create great opportunities.